A dragon boat or dragonboat is nothing but a human-powered watercraft. It is made out of teak wood in the Pearl River Delta region of China's southern Guangdong Province. It is made of various designs and sizes. Different woods are used to manufacture these traditional watercrafts in other parts of China. It belongs to a family of Traditional Paddled Long Boats which are found throughout Africa, Asia and the Pacific Islands. Dragon boats form the base of the team paddling sport called dragon boat racing, an amateur water sport having its roots in an ancient folk lore of competing villagers. It has been held over the past 2000 years all over southern China. While the competition itself has taken place for more than 20 centuries annually as a part of religious ordinances and folk customs, dragon boat racing has surfaced in modern times as an international sport, starting in 1976 in Hong Kong. However, the history of dragon boats in competition goes as far back as the same age as the aboriginal games of Olympia taking place in ancient Greece. Dragon boat racing and the ancient Olympiad both contained aspects of religious commemorations as well as community celebrations, and with competition. 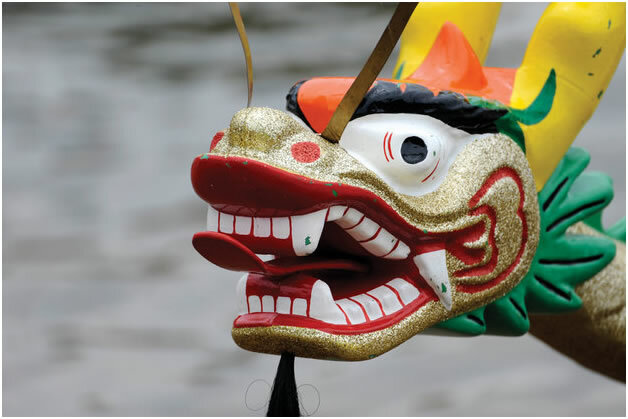 For competitive events, dragon boats are generally decorated with attractive Chinese dragon heads and tails. In times of training the decorations are usually removed, even though the drum often remains aboard for practice by drummers. Dragon boat races are traditionally organized as part of the annual Duanwu Festival or Duen Ng occasion in China. 19th century European observers addressed the spectacle as "the dragon boat festival" as they did not understand the significance of Duanwu. This is the term that became popular in the West. The usual crew of a contemporary dragon typically consists of 22 people, comprising majorly of 20 paddler-pairs facing the bow of the boat. Then there is 1 drummer or caller at the bow end, facing the paddlers and finally 1 sweep or the one who steers at the rear end of the boat. Dragon boats do vary in length however, naturally altering the crew size accordingly, from 10 paddlers in small dragon boats up to 50 paddlers in the traditional boats. This is excluding the drummer and the sweep. The paddlers increase to 80 or more in the area around the Tian, the District of Guangzhou in China. The international dragon boat festival in the western hemisphere was first organized in June 1983 in San Diego, California. They used dragon boats delivered from Singapore and the Hawaiian Outrigger Canoe Club team from San Diego won the festival. In doing so outdid the visiting world champion team from Singapore. Hanohano, Hawaiian Outrigger Canoe Club team, earned the right to represent the USA at the Singapore World Championships in 1984, June. Team USA-San Diego bagged the win in the 1984 Dragon Boat World Championships in Singapore setting a record time, followed by Sweden and Singapore placing second and third respectively. Team USA also won the International Plate race in Macau that same year, outplaying the unbeaten Shunde team from People's Republic of China. Team USA-San Diego continued their winning spree and grabbed more victories in Singapore and China in 1988 and 1989. Vancouver, Canada (June 11 & 12) - The Rio Tinto Alcan Dragon Boast Festival is exactly what one would dream of in a conventional cultural festival. Here, Taoist priests bring to life the spirit of the dragon in a ritual and kick off the two-day affair. You can shop for artisanal goods in a local marketplace and hog on global bites. Big-screen enthusiasts will love the new film program, which comprises an inspiring story of a local and visually impaired team. Boston, Massachusetts (June 12) - What better way to enjoy New England’s summer weather than to observe over 50 teams canoeing down Charles River? The Boston Dragon Boat Festival is a total playground for lovers of crafts. There are many participatory workshops like making zhong zi, folding and shaping Chinese origami paper into butterflies and boats and also decorating opera masks. You can give your creative juices a break at a ethnic lion dance, yo yo show, and other cultural dances from all over Asia. Denver, Colorado (July 30 & 31) - It is no argument that Denver takes its racing quite seriously. The Colorado Dragon Boat Festival starts off with a 75-foot dragon dance and a team parade in traditional costume. Following the launch, the festival features both flag-catching races on Taiwanese boats and lightning-speed races on Hong Kong boats. The competition is sure to get your pulse racing. So why not work it off at a martial arts demonstration or calm down at a meditation? Queens, New York (August 13 & 14) - You think a sporting event would be hard to find around New York? Think again. Because the Hong Kong Dragon Boat Festival in New York boasted over 170 teams last year. Located in Flushing, which is a neighborhood known for its Asian cuisine, the festival has served many a traditional fare like bubble tea, dumplings and shaved ice. If you’re lucky, you can grab some food freebies to enjoy while experiencing traditional dances and crafts demonstrations. San Francisco, California (Sept. 17 & 18) - The San Francisco International Dragon Boat Festival almost looks like a full-blown carnival. The best part? It’s free. Keep the kids and also your wallet happy while making chopstick dragons, riding the choo choo train, or trying a hand at rock climbing. Don’t forget to keep a keen eye out for Kara’s Cupcakes, a cult favorite for those many sweet-tooths. And make sure you catch acts like the ribbon and fan dance, the acrobat show and the wu shu performance.